Fits Samsung Galaxy Tab E 9.6"
Protect your 9.6" Samsung Galaxy Tab E in this black DropTech Case from Gumdrop Cases. This case features reinforced rubber bumpers on all four corners of your Galaxy Tab E. Dual material construction provides multiple layers of shock absorption to help prevent damage in case of accidental impact. Box Dimensions (LxWxH) 10.7 x 8.4 x 1.0"
Do you sell a stand to go with this product? Sorry, I am not aware of a stand that would work with this case. 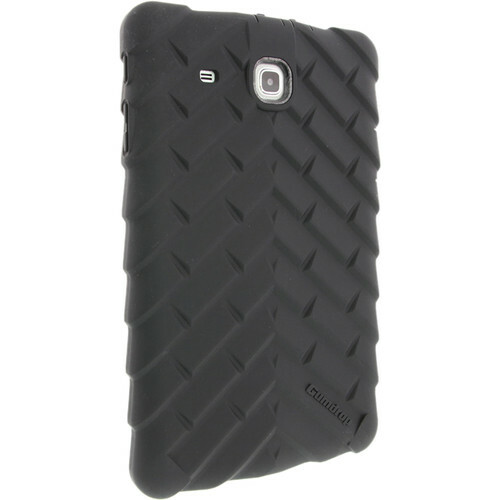 Does this gum drop case fit the Samsung Galaxy Tab E 9.6 Model #: SM T567V? Asked by: Tony R Q. Yes it will, this case is designed specifically to fit the 9.6 Samsung Galaxy Tab E.
Does this case fit Samsung Galaxy Tab E model SM-T560NU ? Yes the model SM-T560NU is a Samsung Galaxy Tab E 9.6 and if fully compatible with this case.